Simpson Strong-Tie has focused on creating structural products that help people build safer and stronger homes and buildings. Simpson Strong-Tie supplies Anchoring, Fastening and Restoration Systems for Concrete and Masonry. Simpson Strong-Tie works closely with industry professionals to provide code-listed, field-tested products and value-engineered solutions. 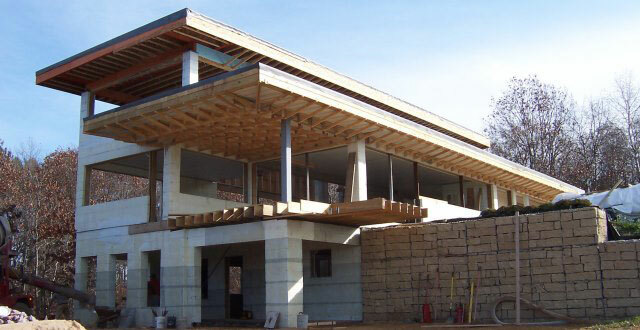 Its structural products are recognized for helping structures resist high winds, hurricanes and seismic forces. The ICFVL, ICFVL-W, & ICFVL-CW ledger connector system is engineered to solve the challenges of mounting steel or wood ledgers on insulated concrete form (ICF) walls. Simpson's ledger connector system is easy, quick and versatile to use. The system offers many benefits over traditional anchor bolting, including better on-center spacing in most cases, faster installation and no protrusions. The perforations in the embedded leg of the ICFVL permit the concrete to flow around it anchoring the ICFVL securely within the concrete. The exposed flange provides a structural surface for mounting either a wood or a steel ledger. Snap chalk line for bottom of ledger. Mark required on center spacing. Cut vertical kerfs at marks. Slip ICFLC-W or ICFLC-CW underneath wood ledger. Attach the 6 D3 screws (provided) partially into ledger, starting at the bottom of the ICFLC-W or ICFLC-CW. Position the ICFLC-W or ICFLC-CW with the ledger against the ICFLC, and drive the screws through the wood and the ICFLC.